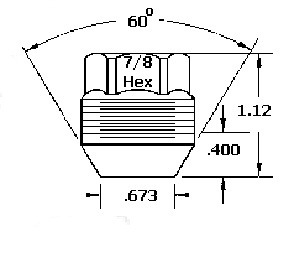 Special GM OEM style 9/16" lug nuts with external threads. These lug nuts allow newer 90-99 Chevy/GMC wheels to put on 73-87 Chevy and GMC trucks. The internal thread is 9/16". Our application guide page will answer most of your application fitment questions but ask us for unanswered question. Sold in each piece. convert lug nuts 14mm to 9/16"